11 July 2013 | Singapore Airlines has been the epitome of luxury for many years now. Many airlines look to the airline, not only for the product they have onboard, but the way that Singapore Airlines effortlessly conveys luxury and sophistication. Singapore Airlines has not failed to deliver on their latest incarnation of products which will replace the current fleets slightly older, but by no means tired cabins. The first aircraft to adopt these new cabins will be the 777-300ER and when it comes into service, the A350. Passengers between Singapore and London will be the first to experience the new seats when they come on line in September. “The significant investment in our next generation of cabin products reaffirms our commitment to product innovation and leadership, and demonstrates our confidence in the future for premium full-service air travel,” said SIA’s Executive Vice President Commercial, Mr Mak Swee Wah. The products seem to be more like luxury train or car, and this is no surprise, as the release is the result of more than two years of working with world-renowned design firms. BMW Group DesignworksUSA assisted with the development of the new First Class, James Park Associates assisted with Business Class and Massive Interactive with the in-flight entertainment system interface. We take a look at the products a little closer. Singapore Airlines’ new First Class seat, features a new fixed-back shell design with curved side panels to provide a clear demarcation of personal space, for added privacy. At 35 inches in width and with an increased bed length from 80 to 82 inches, it is one of the most spacious First Class products in the sky. (But not the most!) Extensive research was conducted to determine how best to increase the comfort of the new First Class seat. An ergonomically sculpted cushion and improved adjustable headrest have been introduced for greater seating comfort, while new features such as a padded headboard for extra support and an additional mattress layer ensure customers enjoy a good rest. The attention to detail here is superb, and shows great research into the seating habits of travellers in such products. We personally love the two types of backing to the seat, depending whether you are configured in bed or seat mode. 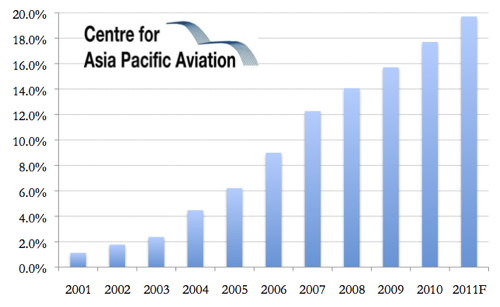 31 May 2011 | The market share (in terms of seats) of low-cost carriers within Asia is expected to reach nearly 20 percent by the end of 2011. However, LCC penetration in the region is still behind that of the USA and Europe, while the middle class across Asia is growing rapidly, creating new demand for affordable air travel. Furthermore, the upcoming ‘open skies’ policy amongst the ASEAN countries, as well as increasing liberalization in Japan and South Korea will further boost air travel in the region. These new market opportunities, plus strong competition from the likes of AirAsia, Cebu Pacific, Lion Air, IndiGo, Spring and Skymark, has led several full-service airlines in the region, such as Qantas (Jetstar), Singapore Airlines (Tiger), Malaysian Airlines (Firefly) and Korean Air (JinAir) to set up their own low-cost subsidiaries in recent years. Joining these airlines in the next year will be Thai Airways and All Nippon Airways, while Singapore Airlines just announced plans to establish a long-haul low-cost subsidiary. Singapore Airlines (SIA) new budget airline will start operating within a year and be based in Singapore. Although fully owned by Singapore Airlines and likely to operate some of SIA’s older model B777s, the new carrier will operate independently. Initial routes of the long-haul budget airline are expected to be to East Asia (China, Japan, South Korea), Australia and India. Other details, such as its name and just how ‘no frills’ the low-cost subsidiary will be, have not yet be announced. According to analysts, SIA has little choice but to start a low-cost long-haul subsidiary because its mainline operation is not growing. In 2010, the airline carried 16.6 million passengers, compared with 19 million in 2007/8. In the same period, Singapore’s Changi Airport saw its passenger traffic growing from 36 million to 44 million. Given the more open air regulations in Singapore vis-à-vis other Asian locations, SIA faces more competitive pressures than some of its peers. For examaple, according to Nomura Investments, LCCs have a market share of 27 percent in Singapore compared with ess than 5 percent in Hong Kong. With its new long-haul low-cost subsidiary, Singapore Airlines is aiming at Qantas’ Jetstar Asia and Malaysia’s AirAsia X as well as Gulf carriers such as Emirates, which have picked up the bulk of new long-haul traffic from Singapore. 6 August 2010 | Singapore Airlines has introduced an electronic version of its its three in-flight magazines – SilverKris (in-flight magazine), KrisShop (sales catalogue); and KrisWorld (entertainment guide) – on its KrisWorld in-flight entertainment system. The digital magazines will be high resolution and passengers will be able to choose their own font, search by keyword, and zoom in to aid reading. Singapore Airlines says it is the first in the world to offer an e-magazine. The e-magazines are part of a trial with a Singapore-based company, SmarttPapers Aviation. and Singapore Airlines says it eventual goal is to create a paperless aircraft.